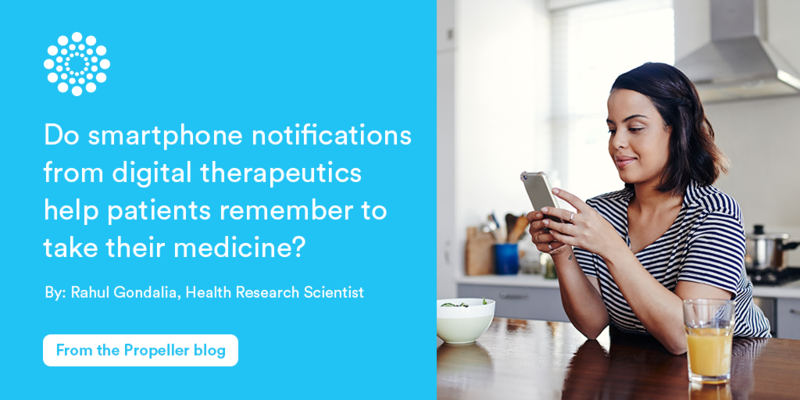 Do smartphone notifications from digital therapeutics help patients remember to take their medicine? Smartphone notifications get a bad rap, and not without reason. If you own a smartphone and haven’t turned off notifications for your various apps, you probably recognize these types of messages. Not all of these notifications are useful, few are necessary and many are designed for a single purpose: to get you to open the app and engage with it. But despite their faults, notifications are designed to trigger a human response: interest, curiosity and ultimately action. And that means they can be used for a positive purpose as well: to help patients adhere to their prescribed medication regimen via a digital medicine. To determine exactly how smartphone notifications improve medication adherence, we partnered with the University of Colorado Health and Children’s Hospital Colorado to study 2,079 patients who manage their asthma via Propeller. With Propeller, patients have the option to receive push notifications 15 minutes after a missed or late dose, based on the medication schedule they enter. They also have the option to disable the alert to their phone. 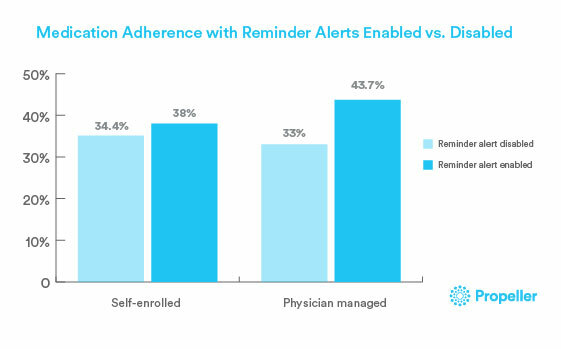 Of the patients we studied, daily adherence was higher for patients who enabled the notification than those who disabled it (38 percent vs. 34 percent among self-enrolled patients, and 43 percent vs. 33 percent for patients enrolled with the help of a physician). A 34 to 38 percent increase in adherence may not seem like a lot until you consider these statistics: raising adherence by five percent can slash overall costs by one percent, a massive return for healthcare organizations. This is because improving medication adherence can reduce the risk of patients having a severe asthma exacerbation and needing emergency care or hospitalization. Propeller will continue to engage in research to examine how smartphone notifications encourage medication adherence, including why some people enable alerts and others don’t, how people respond to alerts based on different variables, and what role physicians play in helping patients adhere. For now, it’s heartening to know that smartphone notifications can do more than just remind you that your cousin has commented on your Facebook post. They also appear to be beneficial in promoting medication adherence. “Benefit of Smartphone Alerts to Improve Adherence to Inhaled Asthma Controllers” was presented at the American College of Allergy, Asthma and Immunology and authored by Heather Hoch, MD, Leanne Kaye, PhD, Rahul Gondalia, MPH, Ben Theye, BS, BA, Meredith Barrett, PhD, David Van Sickle PhD, Stanley Szefler, MD and David Stempel, MD.